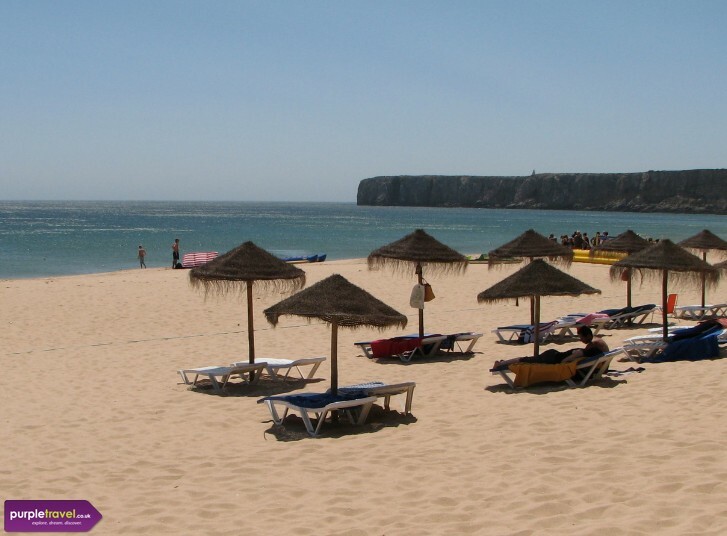 This lovely village in the Western Algarve is the perfect place to take a week or two to soak up the sunshine on one of the many beaches and With a selection of bars and restaurants, a long sandy beach and the beautiful surrounding countryside it’s ideal for a sunshine holiday. There are four great beaches in Sagres. Baleeira Beach, next to the harbour, is a small, sandy beach with rocks on the sand. Away from the beach there is a restaurant just behind the beach and a few bars and restuarants behind the port so you can relax even more. Beliche beach is a really quiet beach maybe owing to the fact that there are no facilities, but its well worth packing a picnic so you can relax on the golden sands and admire the big towering cliffs that are behind the beach. One of the busiest beaches is Mareta beach. The cliffs surrounding it shelter the beach from any winds, making it the perfect sunbathing spot. Last but not least is Matinhal beach, a long stretch of golden sand plus a lighthouse and fishing harbour. Here you will also find a variety of watersports. Away from the beach there is plenty to do to keep you busy. There's the Sagres Fortress, a 15th century church and Roman ruins. Also popular around Sagres are boat trips which are great for fishing, dolphin-spotting or simply taking in amazing views. As for food options, there are many restaurants in Sagres, of course selling great seafood dishes, which you should definitely taste if you like fish, however, if not there are plenty of other choices too. For evening entertainment, there are some bars in Sagres for you to end your night sipping a cocktail. There are also a good few nightclubs if you fancy a night on the tiles. For some retail therapy there are a few shops, many selling locally made goods which are great for unique souvenirs plus once a week there is a flea market where you might be able to pick up a bargain. If Sagres sounds like your type of holiday destination then what are you waiting for, Purple Travel can help you get the best holiday deals to Sagres. Book cheap holidays to Sagres in the Algarve now and save money with Purple Travel. It doesn’t get more idyllic than Sagres. It’s absolutely beautiful, great restaurants, lovely beaches, and the sun was shining all day long! Couldn’t ask for more. Quite close to the airport, so the transfer is very fast, nothing better after stepping off the flight. But it was much quieter than we expected. Beaches are lovely, perfect for sunbathing, and the scenery in the area is lovely.